One-of-a-kind venue blends historical significance and modern day elegance. Pressed copper ceilings with mahogany crown moldings and trim. White oak wood floor throughout. Full size black granite and mahogany wet bar with commercial ice maker and refridgerated beverage drawers. Catering kitchen with ample counter space, double sink, storage refirdgerator, microwave, warming drawer, and oven. Dimming flood lights throughout, as well as rope lighting that accents the copper ceiling. Lots of mirrors and windows. We were rated #1 in Louisville in 2015 providing unparalleled customer service and a versatile and beautiful venue for your special day. 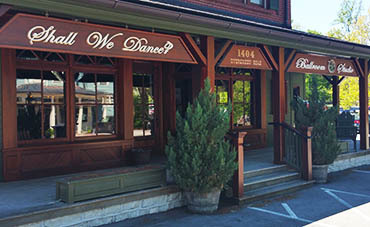 Our covered front porch and front of building gives our venue the look of an old general store. Built in 1939 and completely restored in 2009. The outdoor courtyard is perfect for your wedding ceremony. We offer an open vendor policy. While we would be happy to provide recommendations of highly regarded professionals, you are welcome to bring your own caterer, florist, photographer etc.